This is a primer on disassembling and reassembling Remington R51. You can find my review of the gun here. This video from Remington is the best resource for field-stripping R51. The video shows it the best - but what it does not show is how strong the action spring is, and how difficult the manipulations with the slide become when you have to keep it compressed. Parts can fly, so eye protection is a must when dealing with R51! My own experience with it is below. This is a screen capture from the video above. Did Remington really misspell "breech"? They did! Step one - remove the magazine and make sure the gun does not have a round in the chamber. Step two - pull the slide back with your right hand, grasping it from behind and holding it against the frame with your right hand, so that the notch on the slide is against the slide stop. Push on the slide stop (it helps to have a plastic or wooden dowel) from the right side of the firearm and remove it. Then - while still holding the slide back - grasp the barrel at the serrated part, and pull it, and the slide, off the frame. The breech block will now fall out. If it does not, you can lift it from behind by the striker pin. Step three: when the breech block is out, you can let the spring expand and push the barrel into the space freed by the breech assembly. after that, the barrel can be tilted and pulled - but to do that, you need to push the action spring bushing into the slot on the slide, where it gets wedged. Step four - after the barrel is out, action spring bushing can be coaxed out as well. The reassembly process starts with coaxing the action spring and bushing into the slide. The bushing is wedged into the slide's cut out, and the spring is compressed. WEAR THE EYE PROTECTION - the spring is very strong. You can use a wooden dowel to align it so the barrel is concentric with the hole in the slide, and can move in and out. This is how the slide looks with the barrel in. Compress the spring a little bit to slide in the breech assembly. 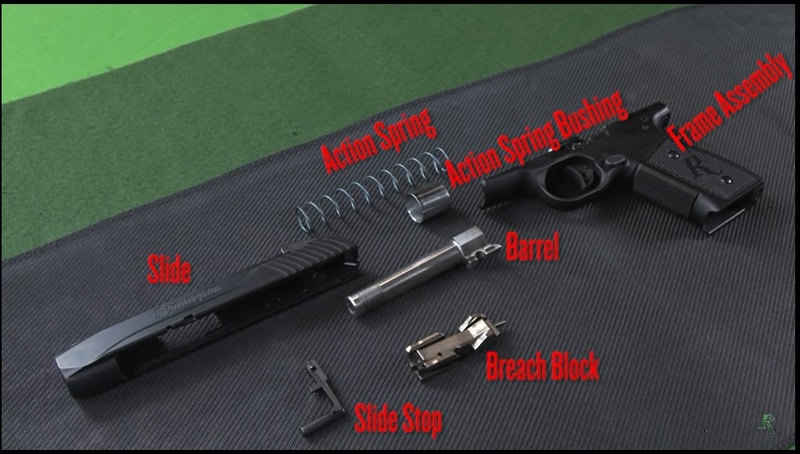 Again, it helps if you grasp the action spring bushing through the bottom of the slide with one finger, and from the ejection port with another finger. You can now slide the barrel onto the frame. This is harder than the video would have it - something in the pistol insides always catches, so you have to coax it, rocking the slide back and forth. Insert the slide stop back into the frame. 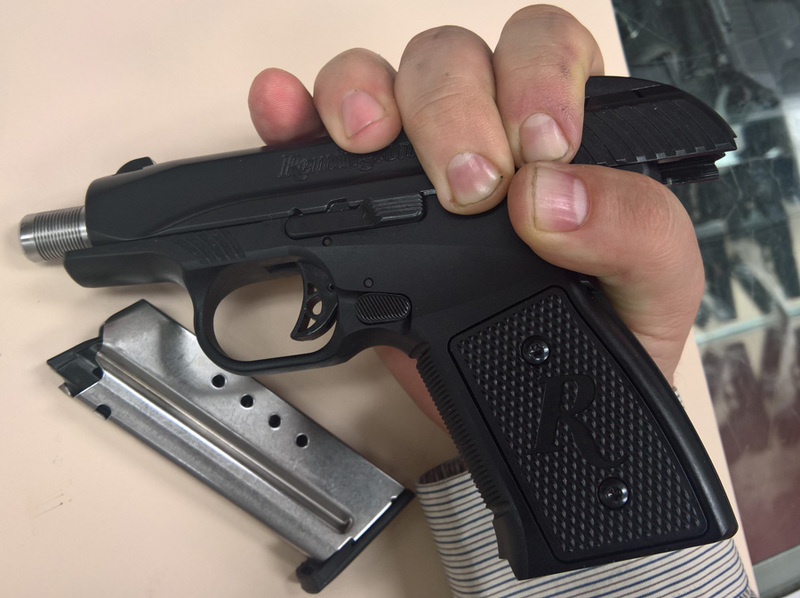 As you can see, assembling/reassembling an R51 is quite a bit more difficult than performing a field strip on most modern pistols. This is not surprising, given that the design for it comes from the early 20th Century - the designs back then were not as user friendly as they are now. I think difficulty in maintenance will definitely impact the market acceptance of the gun.